Showing items in category Malaya and Malayan States, sorted by newest listed first. MALAYA (Perlis) - 1957 1c 'Copra' IMPERFORATE PROOF printers waste pair. 1957 1c 'Copra' IMPERFORATE PROOF pair printed in black on buff paper (SG type 9) from printers waste showing the British Guiana 2c frame (SG type 56) applied in red vertically over the pair. 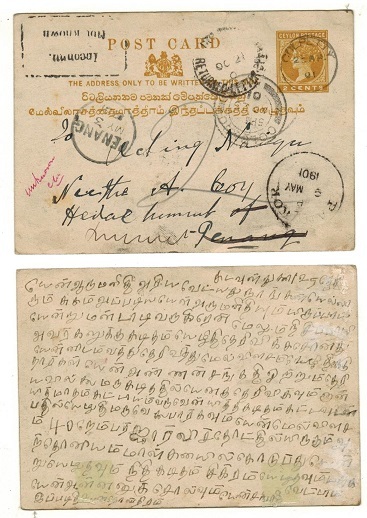 MALAYA (Malacca) - 1923 BRITISH EMPIRE EXHIBITION cover (faults) to India. 1923 (NOV.13.) cover addressed to India (overall toned and opened on two sides) bearing Straits Settlements 1c pair and 4c tied by BRITISH/EMPIRE/EXHIBITION-MALACCA h/s. The cover is brittle and with faults. 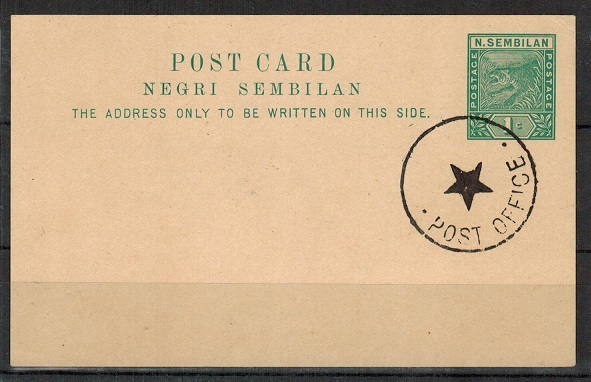 MALAYA (Negri Sembilan) - 1936 2c green PSC unused. H&G 3. 1936 2c green on buff postal stationery postcard in fine unused condition. H&G 3. 1923 cover addressed to India bearing Straits Settlements 1c (x2) and 4c on reverse flap cancelled by PENANG/BRITISH/EMPIRE/EXHIBITION/1924 h/s. Complete with original letter. 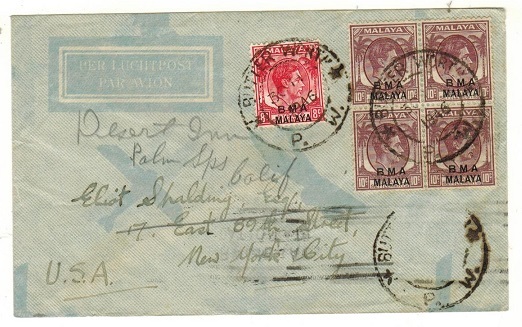 MALAYA (Penang) - 1929 inward unpaid cover with Straits 12c 'Postage Due' added. 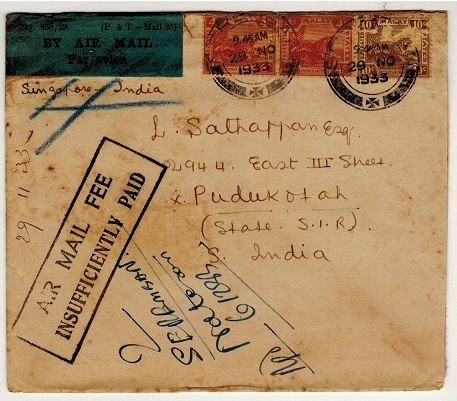 1929 inward unpaid cover from India with 12c blue Straits Settlements 'Postage Due' (SG D6) added on arrival cancelled PENANG. 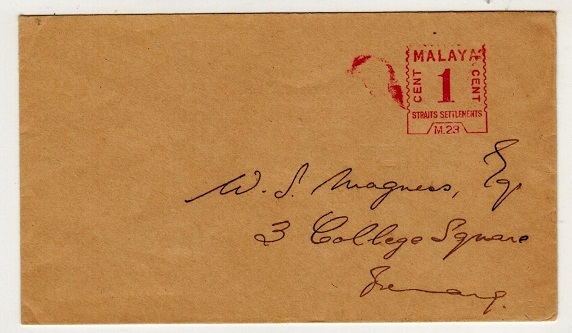 MALAYA (Malacca) - 1931 inward underpaid cover with Straits 2c and 4c 'Postage Dues' added. 1931 (JA.31.) 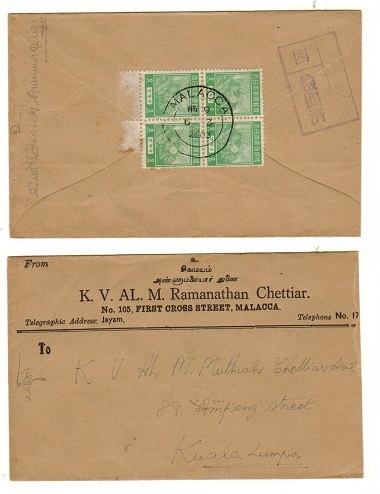 inward underpaid cover from India with 2c black and 4c green Straits Settlements 'Postage Dues' added (SG D2 and 3) tied MALACCA. MALAYA (Malacca) - 1931 6c rate cover to India used at MASJID TANAH/MALACCA. 1931 (JA.2.) 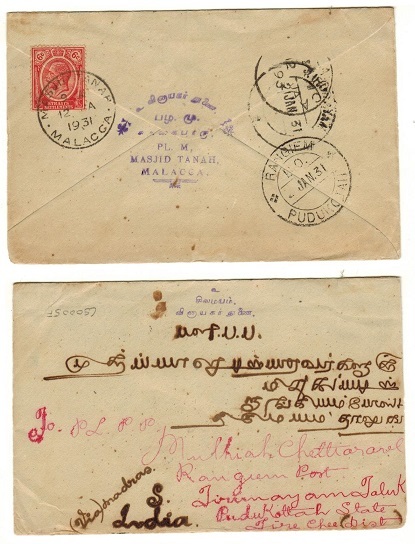 cover addressed to India bearing 6c 'Straits Settlements' adhesive on reverse flap cancelled by MASJID TANAH/MALACCA cds. Malaya (Selangor) - 1901 1c green PSC used at KUALA LUMPUR with 'Sailors Day' reverse. H&G 1. 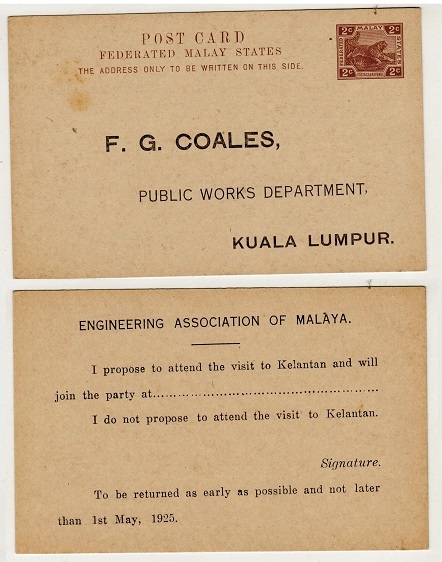 1901 1c green on buff postal stationery postcard addressed locally and cancelled by KUALA LUMPUR cds dated SE.5.17. (corner repair) with the reverse side pre-printed for use by the 'Rubber Exhibition Sub Committee' headed SELANGOR SAILORS DAY. H&G 1. 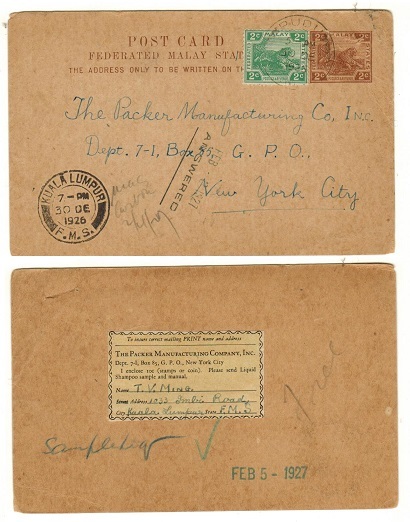 MALAYA (Selangor) - 1923 2c brown 'FMS' PSC to USA uprated at PUDU with additional 2c. H&G 13. 1923 2c brown on buff F.M.S. 'tiger' postal stationery postcard addressed to USA (staple hole through top right corner) bearing additional 'tiger' 2c green adhesive and tied PUDU and dated 30.DE.26. H&G 13. 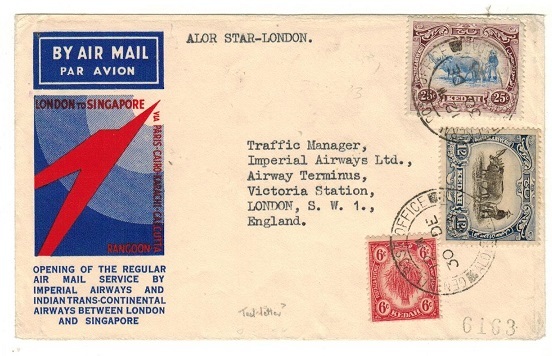 SINGAPORE - 1934 12c rate 'S.S.RESOLUTE' maritime cover to USA. 1934 cover addressed to USA bearing Straits Settlements 2c,4c and 6c adhesives tied SINGAPORE and struck at left by AROUND THE WORLD CRUISE S.S.RESOLUTE maritime handstamp. 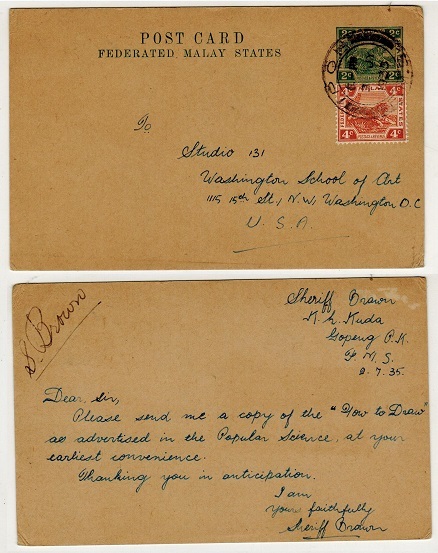 MALAYA (Penang) - 1934 12c rate 'S.S.RESOLUTE' maritime cover to USA. 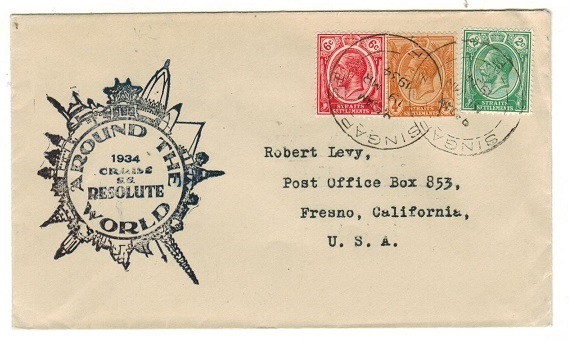 1934 cover addressed to USA bearing 12c adhesive tied by PENANG d/r cds and struck at left by AROUND THE WORLD CRUISE S.S.RESOLUTE maritime handstamp. 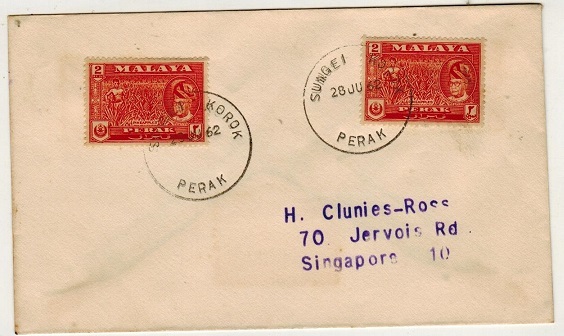 MALAYA (Selangor) - 1925 underpaid local cover with Straits 1c+8c 'Postage Dues' added. 1925 (AU.1.) 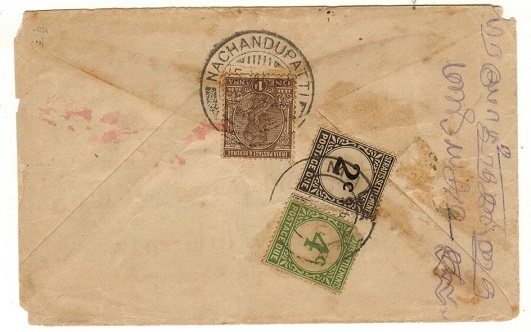 underpaid cover addressed locally bearing Straits Settlements 1c green adhesive tied by unusual oval barred 'dumb' cancel with KUALA LUMPUR cds at left. The envelope was struck by scarce black triangular 'K.T.L.' 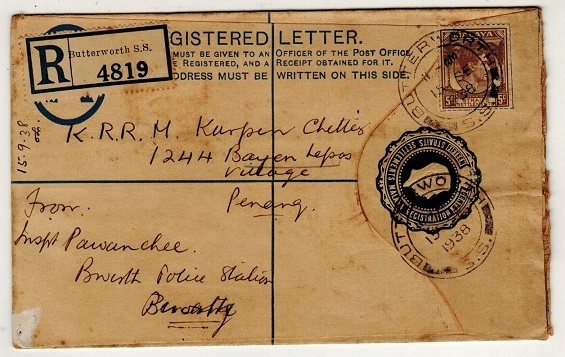 tax mark and on arrival has had Straits 1c violet and 8c red 'Postage Dues' added and tied PENANG. MALAYA (Perak) - 1942 8c rate cover used locally at IPOH during Japanese Occupation. 1942 cover addressed locally bearing Perak 8c scarlet overprinted DAI NIPPON/2602/MALAYA cancelled by large star type PERAK/YUBIN KYOKO/IPOH cds dated AUG.1.2602. Black boxed Japanese chop at left. 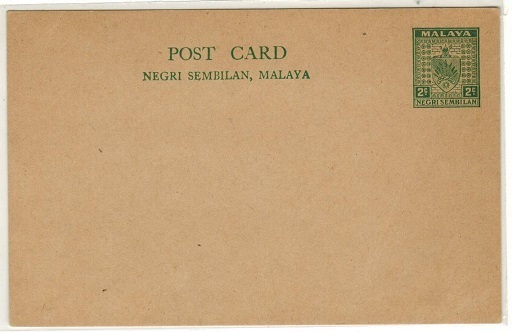 MALAYA (Negri Sembilan) - 1933 underpaid cover to India with INSUFFICIENTLY PAID h/s applied. 1933 (NO.29.) 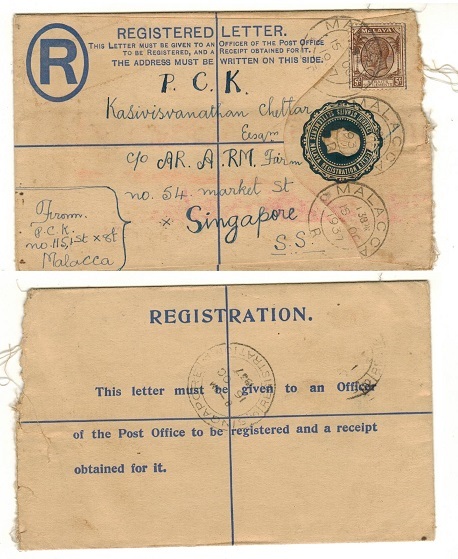 'Singapore-India' flight cover bearing FMS 4c (x2) and 10c (damaged) 'tiger' adhesives tied SEREMBAN (overall aged and toned) with the black on blue 'Ptg 458/29 / BY AIR MAIL' label crossed through in blue manuscript and struck below by scarce black boxed AIR MAIL FEE/INSUFFICIENTLY PAID instructional handstamp. MALAYA (Perak) - 1942 8c rate cover used locally at TAIPING during Japanese Occupation. 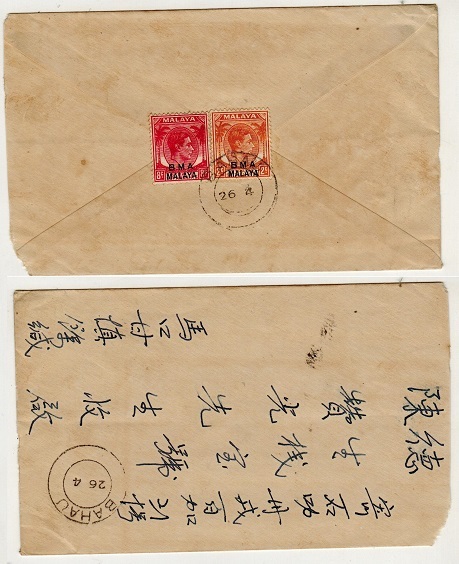 1942 cover addressed to Penang marked 'Tamil Letter' (fold at right) bearing Negri Sembilan 2c orange and 8c grey 'DAI NIPPON' overprints for use by the Japanese (SG J229 and J232) with the 2c showing scarce RAISED QUAD variety in front of the 'Dai' overprint cancelled by PERAK/TAIPING 'cog wheeled' cancel in black dated 6.JUL.2602 with small Japanese chop alongside and d/r DAI NIPON/GPO PENANG cds below struck in transit on the following day. A scarce use during the Japanese occupation. MALAYA (Perak) - 1942 8c rate use of local cover during Japanese Occupation at KAMPAR. 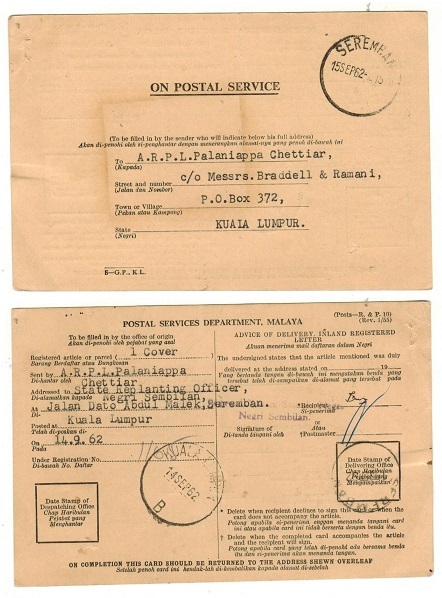 1942 use of 'ON GOVERNMENT SERVICE' manilla envelope (133x105mm) addressed to Kuala Lumpur & h/s'd at bottom 'Medical Officer/Kampar' bearing Pahang 8c ovpt'd DAI NIPPON/2602/MALAYA & cancelled by scarce cogged wheel PERAK/ KAMPAR/2602/YUBIN KYOKU h/s in black. Used during the Japanese Occupation of Malaya. 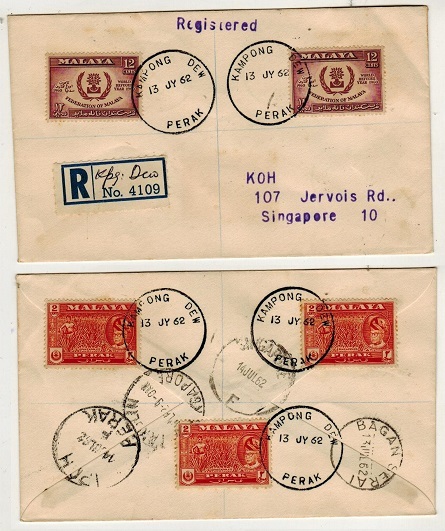 MALAYA (Kedah) - 1949 'RETOUR' and 'UNDELIVERED' local cover. 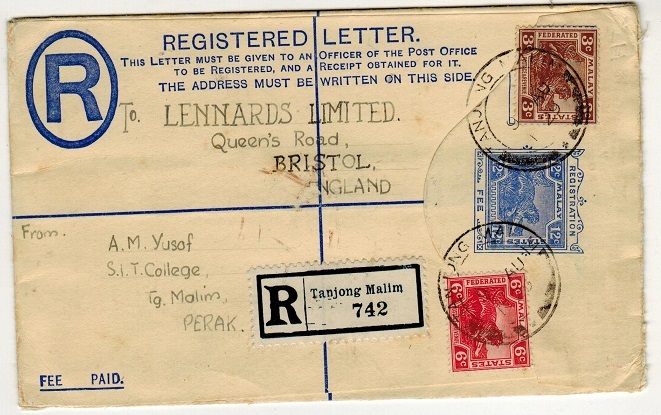 1949 inward 10c 'Coronation' use cover from Penang with KARANGAN arrival dated 12.JAN.49. 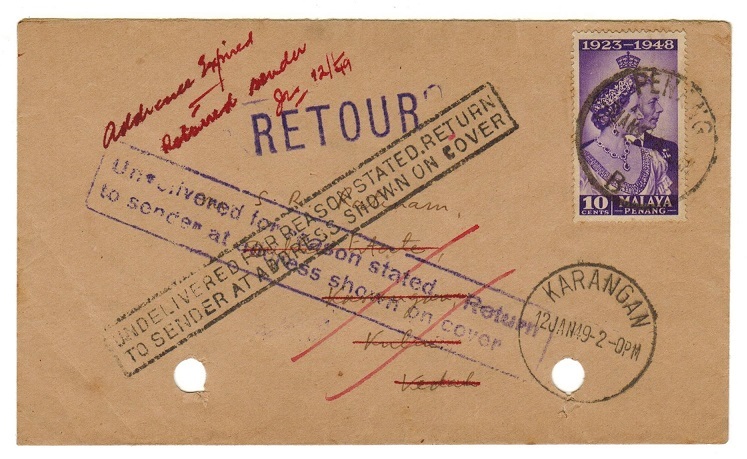 The cover could not be delivered and is struck by black UNDELIVERED FOR REASON STATED- RETURN TO SENDER AT ADDRESS SHOWN ON COVER and additional strike in a different type struck in violet ink. Large RETOUR mark and with PENANG b/s and violet boxed REFUSED/ DECEASED/INSUFFICIENTLY ADDRESSED/NOT ADDRESSED/GONE AWAY instructional box. Two file holes at bottom edge of cover but a nice set of markings. 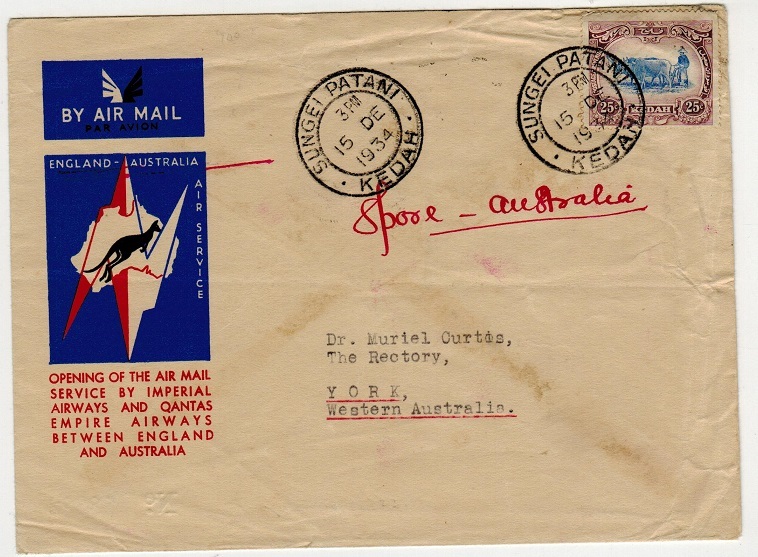 MALAYA (Kedah) - 1934 first flight cover to Australia. 1934 (DE.15.) illustrated 'Imperial Airways and Qantas' first flight cover addressed to York in Western Australia bearing 25c adhesive tied by SUNGEI PATANI/KEDAH cds. 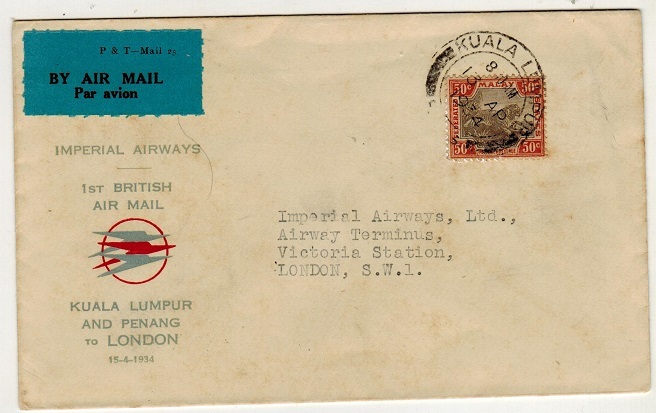 MALAYA (Kedah) - 1933 first flight cover to UK. 1933 (DE.30.) illustrated 'Imperial Airways/Indian Trans-Continental' first flight cover addressed to UK bearing 6c, 12c and 25c adhesives tied GENERAL POST OFFICE/ALOR STAR KEDAH cds's. MALAYA (Straits Settlements) - 1938 (KEVII) 'photographic' ESSAYS of proposed designs. 1938 (King Edward VIII) 'photographic' ESSAY of the proposed un-issued adhesive showing two variations of the frame and name tablets. 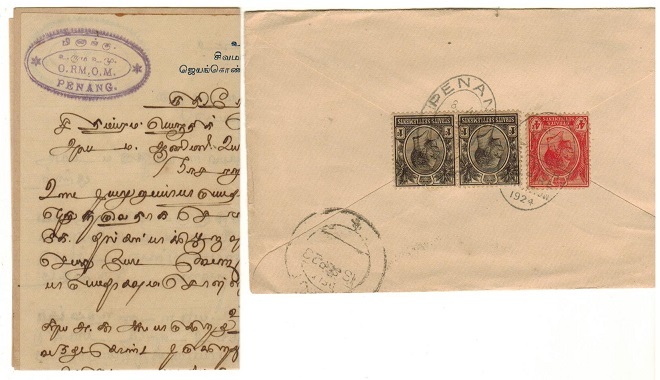 MALAYA (Penang) - 1891 inward 2c PSC from Ceylon to PANGKOR ISLAND struck INCONNU/NOT KNOWN. 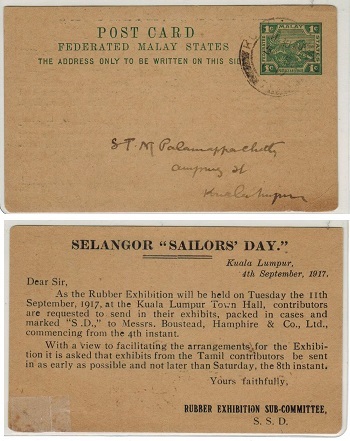 1891 inward use of 2c postal stationery postcard from Ceylon with s/r PENANG arrival strike dated MY.3.91 and rare 'italic' PANGKOR arrival (Proud type D3). The card was not delivered and struck by scarce black boxed INCONNU/NOT KNOWN instructional strike. MALAYA (Penang) - 1937 2c green PSC of Straits Settlements used locally from PENANG. H&G 36. 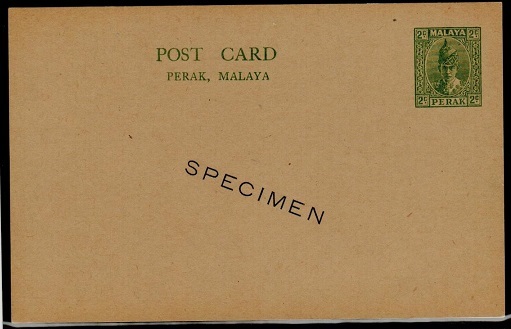 1937 2c green on buff postal stationery postcard of Straits Settlements (H&G 36) addressed to Kedah and bearing additional 1c black (x2-one with fault) tied by light PENANG cds and with ALOR STAR/KEDAH arrival at left dated 8.MY.1941. MALAYA (Penang) - 1945 'BUTTERWORTH/P.W.' cover to USA (one stamp missing). 1945 (30.11.) 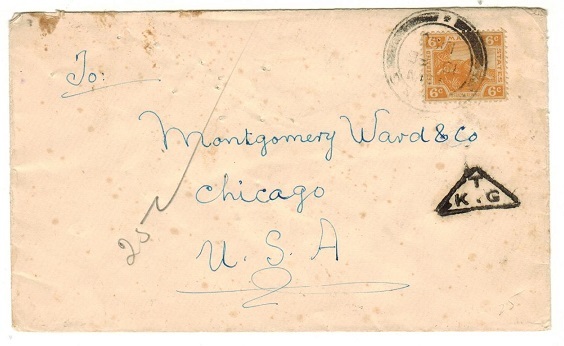 cover addressed to USA bearing 8c and 10c block of four cancelled by scarce BUTTERWORTH/ P.W. cds (Proud type K). Unfortunately one stamp is missing from below the 10c block. 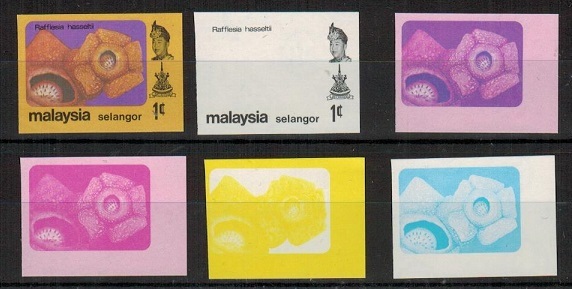 MALAYA (Selangor) 1979 1c 'Raf Flesia Hasselti' range of six IMPERFORATE COLOUR TRIALS. 1979 1c 'Raf Flesia Hasselti' (SG type 11) IMPERFORATE COLOUR TRIAL printed in the issued colours together with and additional strike of the head and name/value tablets without vignette and four further examples showing individual colours used to make up the stamp. 6 colour trials on gummed paper. Fine and scarce. 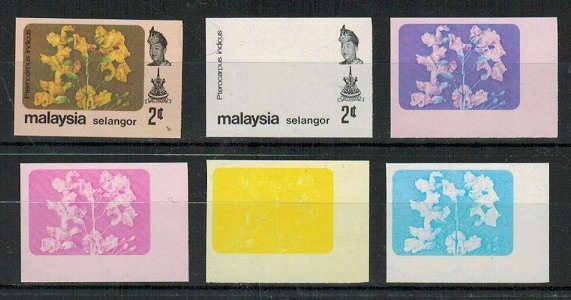 MALAYA (Selangor) 1979 2c 'Pterocarpus Indicus' range of six IMPERFORATE COLOUR TRIALS. 1979 2c 'Pterocarpus Indicus' (SG type 11) IMPERFORATE COLOUR TRIAL printed in the issued colours together with and additional strike of the head and name/value tablets without vignette and four further examples showing individual colours used to make up the stamp. 6 colour trials on gummed paper. Fine and scarce. MALAYA (Selangor) - 1942 15c dark blue RPSE unused ovpt'd for use during Japanese Occupation. H&G 8. 1942 15c dark blue on cream registered postal stationery envelope (size G) in fine unused condition overprinted with vertical red Kanji overprint for use during Japanese Occupation. H&G 8. MALAYA (Perak) - 1942 2c orange PSC unused overprinted for Japanese Occupation. H&G 8. 1942 2c orange on buff postal stationery postcard (lightly toned) with black square MALAYA/ 2 cts/POSTAGE ast left and overprinted DAI NIPPON/2602/MALAYA for use during the Japanese Occuptaion in unused condition. H&G 8. 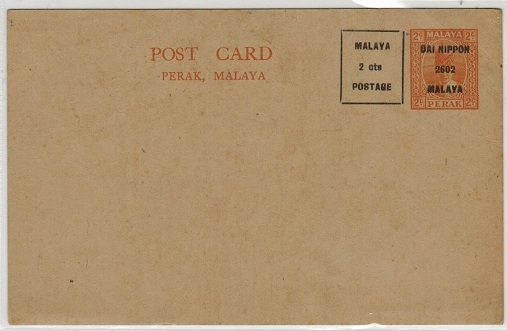 MALAYA (Perak) - 1941 PASSED FOR TRANSMISSION 5 censor cover to Australia used at MALIM NAWAR. 1941 (SE.20.) 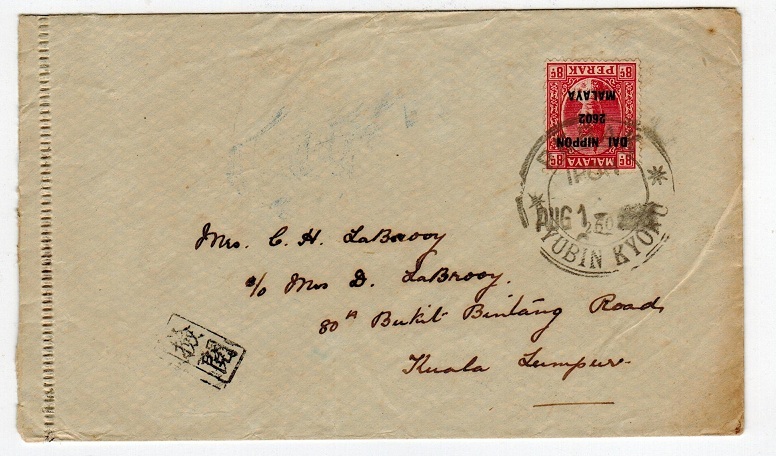 'tatty' (with faults) cover addressed to Australia bearing Perak 8c grey adhesive tied by MALIM NAWAR d/r cds and struck at lower left by violet triangular PASSED FOR/5/ TRANSMISSION censor strike. 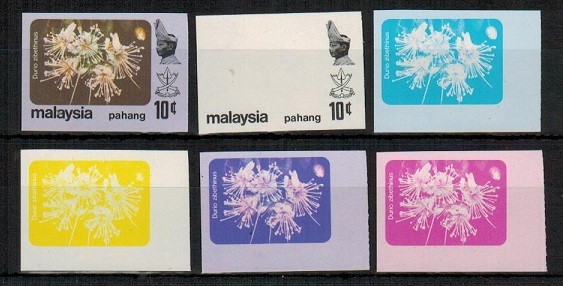 MALAYA (Pahang) - 1979 10c 'Durio Zibethinus' range of six IMPERFORATE COLOUR TRIALS. 1979 10c 'Durio Zibethinus' (SG type 20) IMPERFORATE COLOUR TRIAL printed in the issued colours together with and additional strike of the head and name/value tablets without vignette and four further examples showing individual colours used to make up the stamp. 6 colour trials on gummed paper. Fine and scarce. 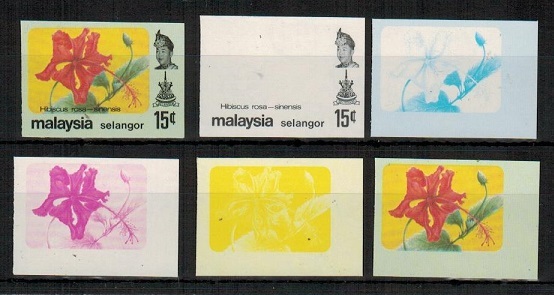 MALAYA (Selangor) - 1979 5c 'Lagerstromia Speciosa' range of six IMPERFORATE COLOUR TRIALS. 1979 5c 'Lagerstroemia Speciosa' (SG type 11) IMPERFORATE COLOUR TRIAL printed in the issued colours together with and additional strike of the head and name/value tablets without vignette and four further examples showing individual colours used to make up the stamp. 6 colour trials on gummed paper. Fine and scarce. MALAYA (Selangor) - 1979 15c 'Hibiscus Rose' range of six IMPERFORATE COLOUR TRIALS. 1979 15c 'Hibiscus rose' (SG type 11) IMPERFORATE COLOUR TRIAL printed in the issued colours together with and additional strike of the head and name/value tablets without vignette and four further examples showing individual colours used to make up the stamp. 6 colour trials on gummed paper. Fine and scarce. 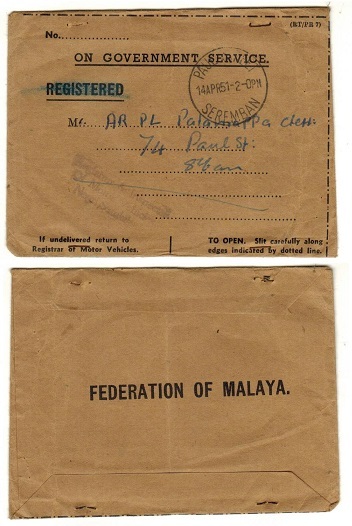 MALAYA (Kedah) - 1946 use of TELEGRAM form complete with original envelope from ALOR STAR. 1946 (NO.9.) use of (Telecoma-Tg4) B.M.A. 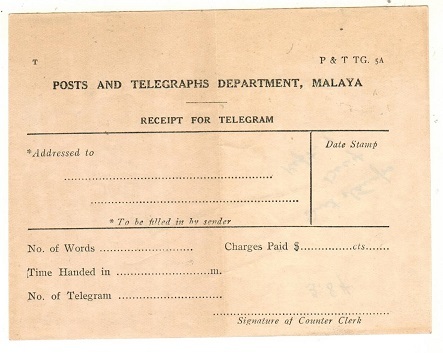 (Malaya) Telecommunications RECEIVING FORM cancelled TELEGRAPH OFFICE/ALOR STAR and complete with the original envelope. 1932 (JA.6.) black on cream (P & T Tel. 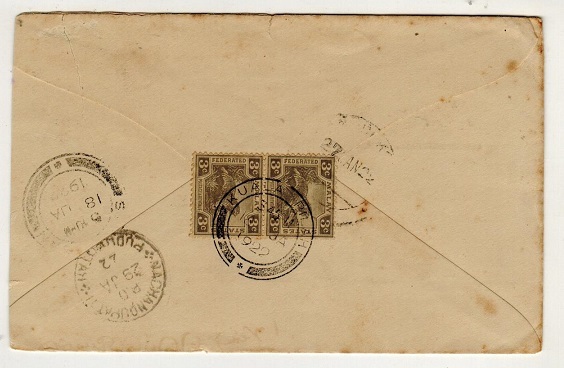 4c) STRAITS SETTLEMENTS AND FEDERATED MALAY STATES telegram form cancelled SEREMBAN complete with original envelope. 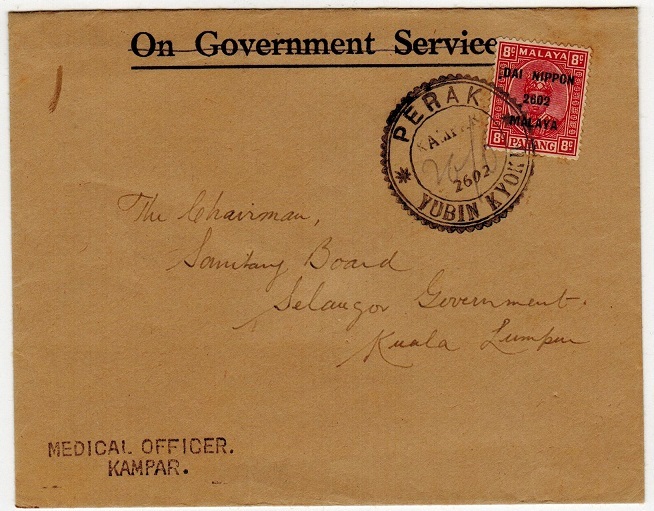 MALAYA (Selangor) - 1929 TELEGRAM complete with original envelope used at KLANG. 1929 (AU.26.) 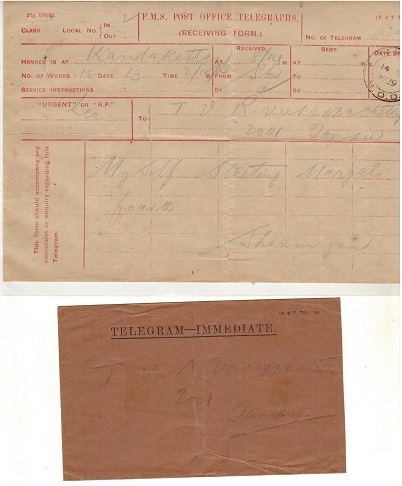 black on cream F.M.S.POST OFFICE TELEGRAPHS form cancelled by KLANG/ TELEGRAPH cds complete with the original envelope. MALAYA (Penang) - 1959 TELEGRAM complete with original envelope used at BUKIT MERTAJAM. 1958 (SEP.4.) black on buff COMMUNICATIONS DEPARTMENT MALAYA/RECEIVING FORM cancelled BUKIT MERTAJAM complete with original envelope. 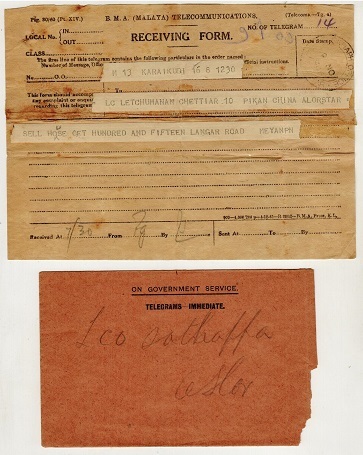 MALAYA (Negri Sembilan) - 1931 TELEGRAM complete with original envelope used at SEREMBAN. 1931 (JA.24.) 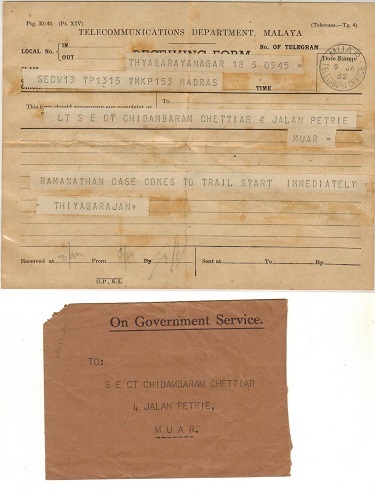 black on cream F.M.S.POST OFFICE TELEGRAPHS/RECEIVING FORM cancelled by SEREMBAN cds and complete with original envelope. 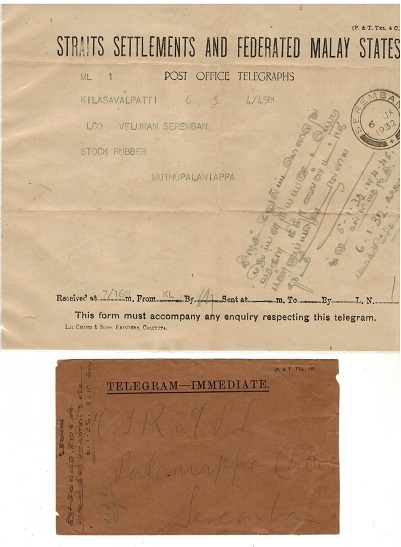 MALAYA (Negri Sembilan) - 1929 TELEGRAM complete with original envelope used at TAMPIN M.O.O. 1929 (DE.14.) 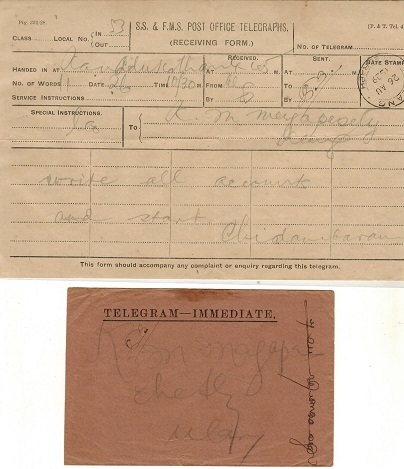 red on cream F.M.S.POST OFFICE TELEGRAPHS form cancelled TAMPIN/ M.O.O. and complete with original envelope. 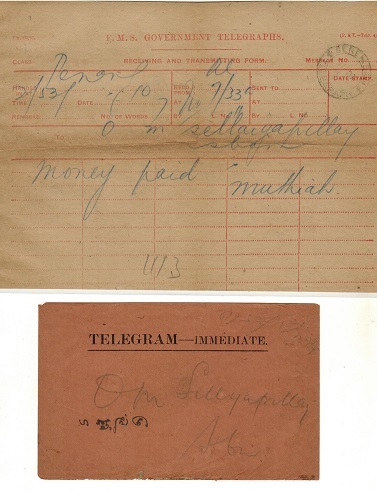 MALAYA (Negri Sembilan) - 1919 TELEGRAM complete with original envelope used at SEREMBAN. 1919 (DE.11.) 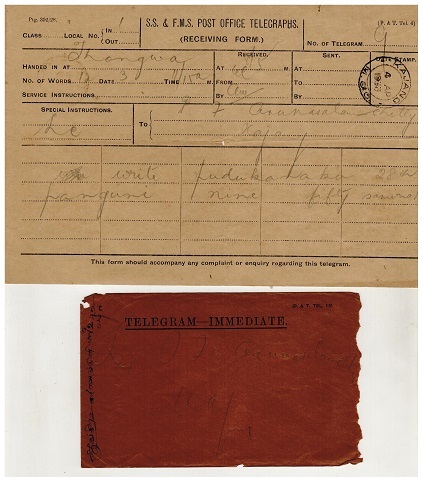 red on buff F.M.S.GOVERNMENT TELEGRAPHS form cancelled SEREMBAN/ TELEGRAPH and complete with original envelope. MALAYA (Kedah) - 1958 TELEGRAM complete with original envelope used at KULIM. 1958 (JUN.16.) 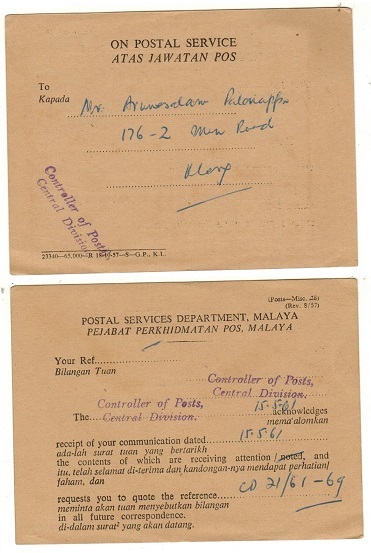 black on buff COMMUNICATIONS DEPARTMENT MALAYA/RECEIVING FORM cancelled KULIM and complete with original envelope. MALAYA (Kedah) - 1947 TELEGRAM complete with original envelope used at ALOR STAR. 1947 (MY.29.) 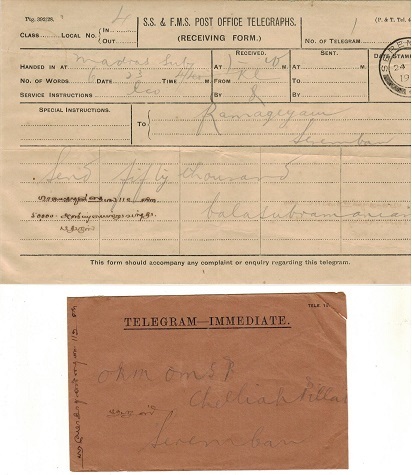 black on buff TELECOMMUNICATION DEPARTMENT MALAYA/RECEIVING FORM cancelled by TELEGRAPH OFFICE/ALOR STAR cds complete with original envelope. 1947 (SE.4.) black on buff COMMUNICATIONS DEPARTMENT MALAYA/RECEIVING FORM camncelled by TELEGRAPH OFFICE/ALOR STAR cds complete with original envelope. MALAYA (Johore) - 1962 TELEGRAM and original envelope used at MUAR. 1962 (JA.5.) black on cream COMMUNICATIONS DEPARTMENT MALAYA/RECEIVING FORM cancelled MUAR/TELEGRAPH OFFICE cds complete with original envelope. 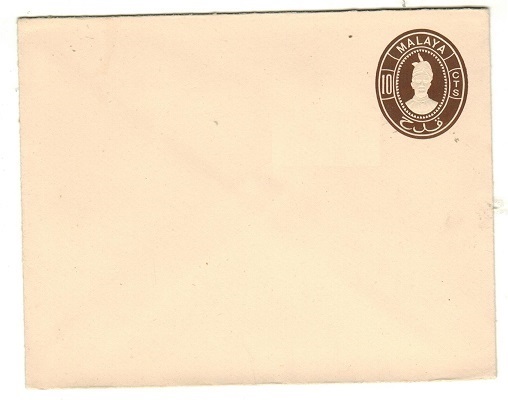 MALAYA (Straits Settlements) - 1930's (circa) OHMS telegram envelope addressed to Malacca. 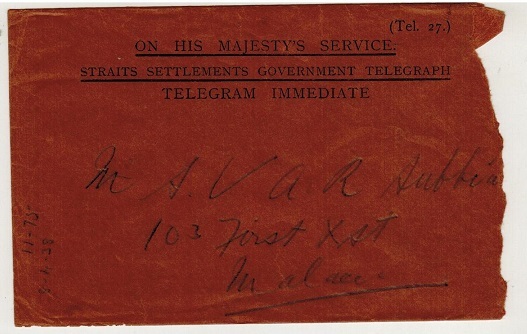 1930's (circa) (TEL.27) ON HIS MAJESTYS SERVICE/STRAITS SETTLEMENTS GOVERNMENT TELEGRAPH/TELEGRAM envelope addressed to Malacca. No postal cancellations. MALAYA (F.M.S.) - 1918 2c green PSC unused 'Private Printed' for use by Engineering Assoc. H&G 9. 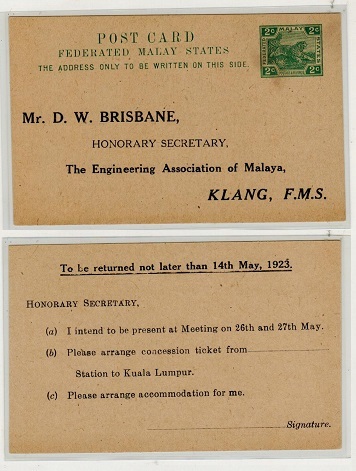 1918 2c green on buff postal stationery postcard (H&G 9) in fine unused condition pre-printed to 'The Engineering Association Of Malaya' in Klang and with the reverse side privately printed for its meeting in May 1923. Printed on a 'thin' card with the H&G stating ' There is a question as to whether this card exists. An unusual 'Private' printed use. MALAYA (F.M.S.) - 1923 2c brown PSC unused 'Privately Printed' for Public Works Dept. H&G 13. MALAYA (F.M.S.) - 1934 50c rate first flight cover to UK. 1934 (AP.13.) illustrated 'Imperial Airways-Kuala Lumpur and Penang to London' first flight cover addressed to UK and bearing fms 50c 'tiger' adhesive tied KUALA LUMPUR. Special blue 'P & T - Mail 25' air mail label applied and with IMPERIAL AIRWAYS/AIR TERMINUS arrival b/s. MALAYA (Penang) - 1927 4c rate postcard use to UK used at BUTTERWORTH/PENANG. 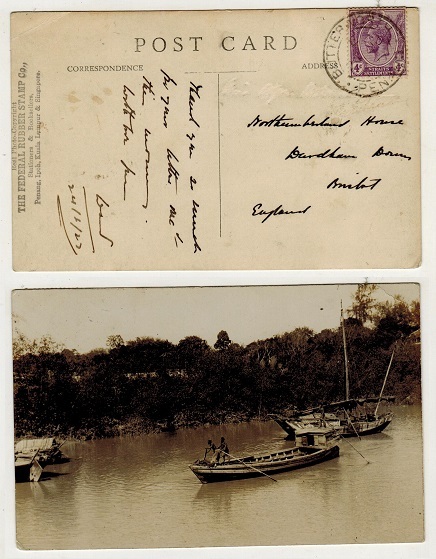 1927 use of real photo picture postcard addressed to UK depicting a river boat scene bearing Straits settlements 4c violet tied by d/r BUTTERWORTH/PENANG cds. (Proud type G). 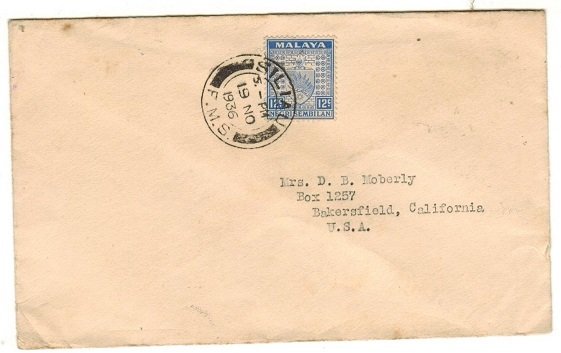 MALAYA (Selangor) - 1926 6c rate cover to USA with 'T/K.G.' tax mark applied. 1926 (FE.19.) 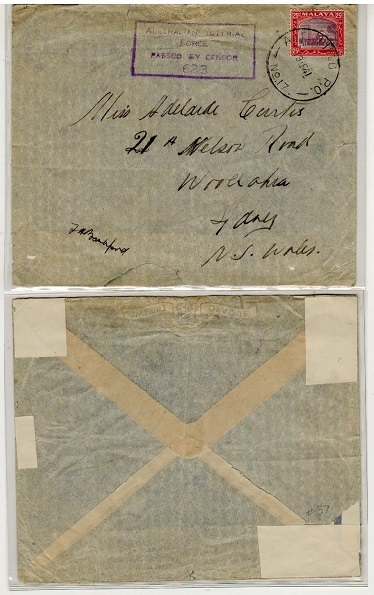 cover addressed to USA (light tone spotted) bearing 6c yellow 'tiger' adhesive tied by light KLANG cds and being under paid having scarce triangular 'T/K.G.' tax mark applied Proud type UP2. 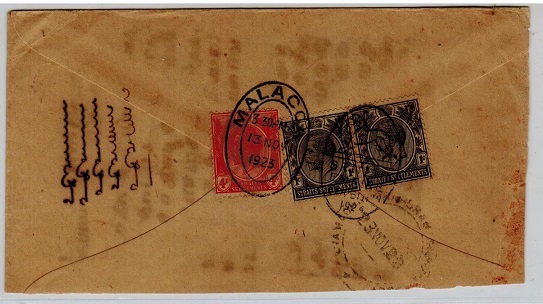 MALAYA (Perak) - 1930 'RECEIVED AFTER/SHIPS DEPARTURE' cover to Aden used at IPOH. 1930 (JA.14.) 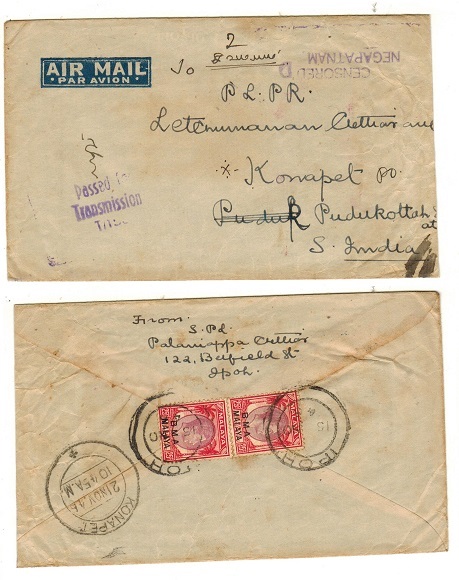 cover addressed to Aden and then returned bearing FMS 2c and 4c tied IPOH. The cover is centrally folded and aged but bears a strike of the violet boxed RECEIVED AFTER/ SHIPS DEPARTURE on reverse. MALAYA (Selangor) - 1929 underpaid cover to UK (faults) with 'sTt' tax mark. 1929 (OCT.15.) 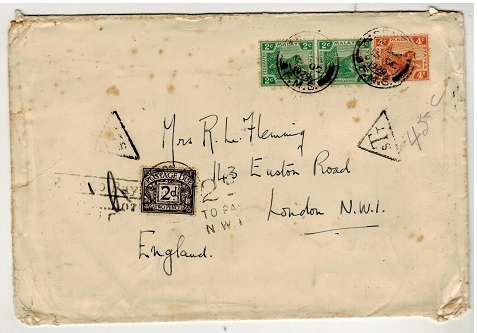 cover addressed to UK (faults and some tone spots) bearing FMS 2c (x2) and 4c adhesives tied SENTUL/FMS and with two strike sof the scarce black triangular 'sTt' tax mark. GB 2d 'Postage Due' applied on arrival. MALAYA (Selangor) - 1953 25c rate 'PASSED CNO ER/S1/44' censor cover to India. 1953 (MAR.21.) cover addressed to India bearing 25c adhesive tied KUALA LUMPUR and struck on the front by scarce PASSED C NO ER.S1/44 handstamp in violet. MALAYA - 1941 'AIF FIELD PO/No.17' Australian Forces censor cover to Australia. 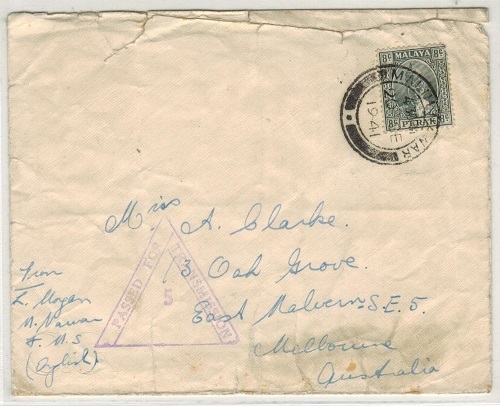 1941 cover addressed to Australia (re-inforced corners on reverse side) bearing 25c adhesive tied by A.I.F. 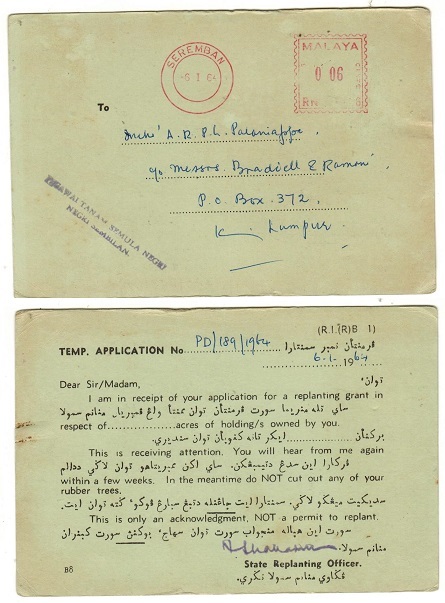 FIELD P.O..No.17 cds with violet boxed AUSTRALIAN IMPERIAL/FORCE/PASSED BY CENSOR/623 h/s at left. A scarcer use by Australian forces in Malaya. MALAYA (Straits Settlements) - 1930/40's 1c red 'meter' mark cover used locally. 1930/40 circa stampless cover to Penang cancelled by MALAYA/1 CENT/STRAITS SETTLEMENTS/M.23 meter marking. 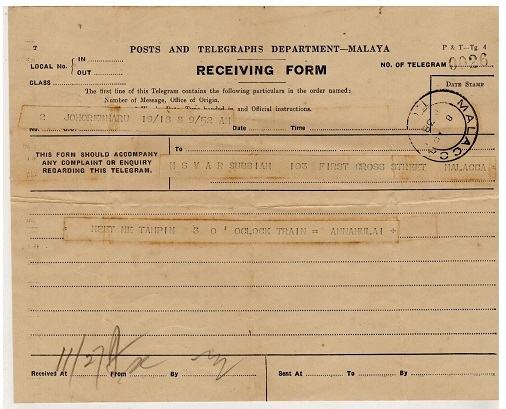 MALAYA (Malacca) - 1938 TELEGRAM 'Receiving Form" used at MALACCA/T.O. 1938 (AP.8.) 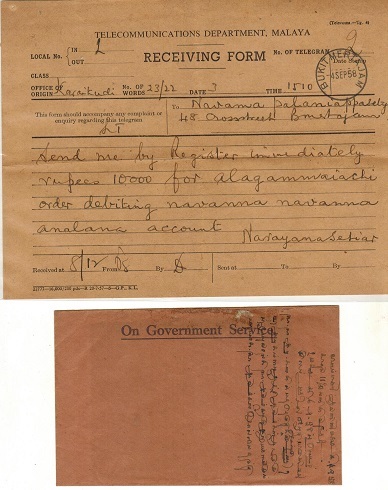 use of POSTS AND TELEGRAPHS DEPARTMENT MALAYA/RECEIVING FORM cancelled MALACCA/T.O. (Telegraph Office). 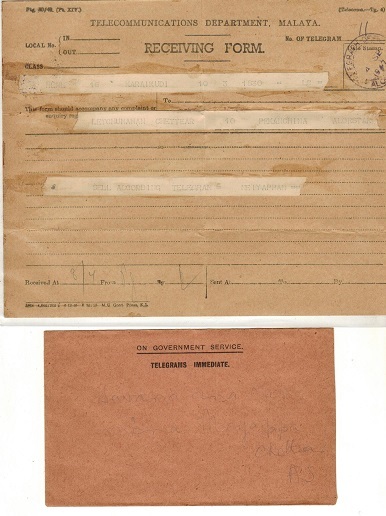 MALAYA (Pahang) - 1940 TELEGRAM 'Receiving Form' used at KUANTAN/F.M.S. 1940 (AP.16.) 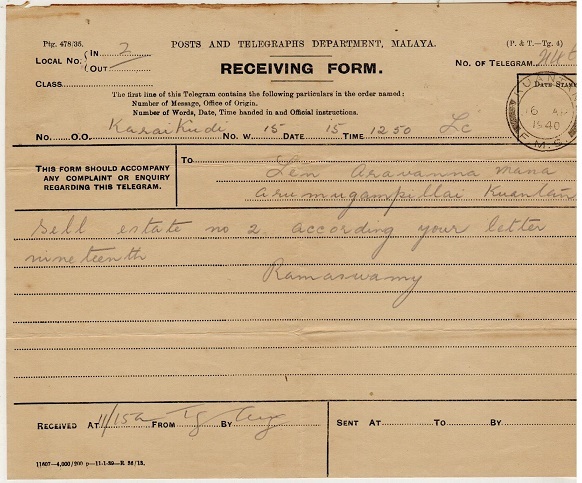 use of POSTS AND TELEGRAPHS DEPARTEMNT MALAYA/RECEIVING FORM cancelled KUANTAN/F.M.S. MALAYA (Selangor) - 1933 TELEGRAM envelope and form used at KAJANG/M.O.O. 1933 (AP.4.) use of S.S. & F.M.S. POST OFFICE TELEGRAPHS form cancelled by KAJANG/M.O.O. cds (Money Order Office) complete with original (P & T TEL15.) 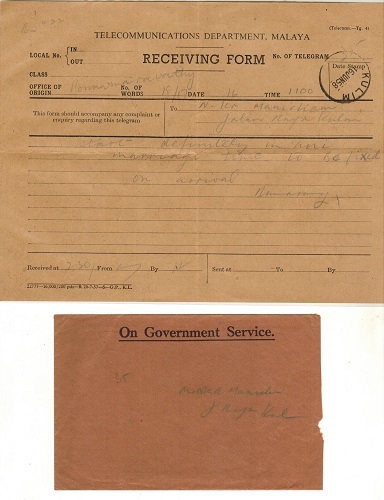 telegram envelope. MALAYA (F.M.S.) - 1930 (circa) TELEGRAM receipt form unused. 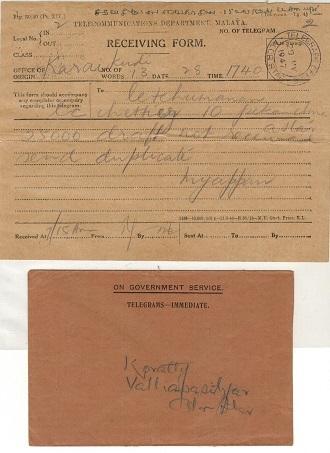 1930 (circa) 'P & T TG 5a' POSTS AND TELEGRAPHS DEPRATMENT MALAYA telegram receipt unused. 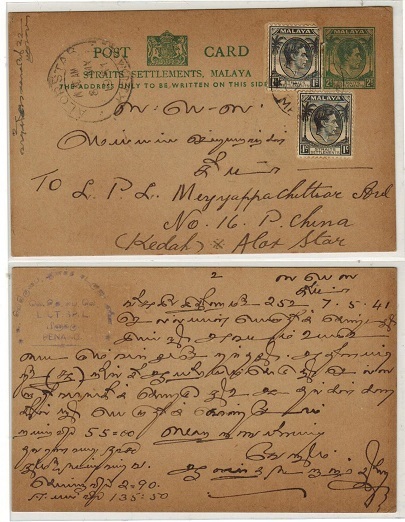 MALAYA (Negri Sembilan) - 1897 1c green PSC struck by star POST OFFICE circular strike. H&G 1. 1897 1c green postal stationery postcard in unused condition struck by unusual five pointed star in circle with POST OFFICE around the bottom edge. H&G 1. MALAYA (Negri Sembilan) - 1936 12c rate cover to USA used at SILIAU. 1936 (NO.19.) 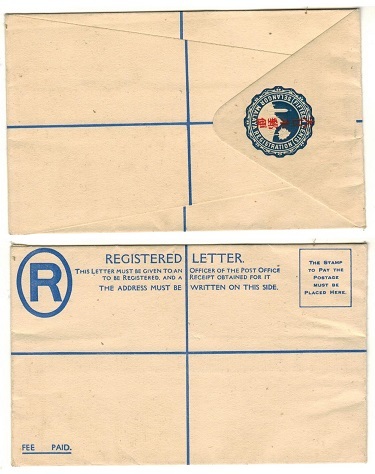 cover addressed to USA bearing 12c ultramarine adhesive tied by neat d/r SILIAU/FMS cds. MALAYA (Selangor) - 1955 illustrated 'STAMP EXHIBITION' cover to UK. 1955 (AUG.27.) 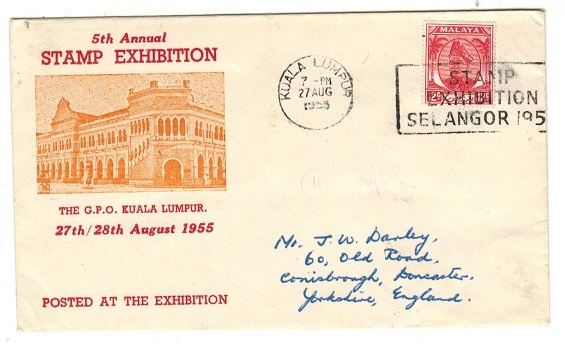 illustrated '5th Annual Stamp Exhibition' cover addressed to UK bearing 12c adhesive tied by STAMP EXHIBITION SELANGOR 1955 boxed cancel with KUALA LUMPUR cds at left. MALAYA (Selangor) - 1964 use of official card cancelled by red 'MALAYA/ 0.06c' meter mark. 1964 (6.I.) use of stampless (R.I. R B-1) STATE REPLANTING OFFICER postcard addressed locally and struck by red SEREMBAN/ MALAYA 0.06 meter mark. MALAYA (Selangor) - 1962 use of 'ON POSTAL SERVICE' postcard used at KUALA LUMPUR. 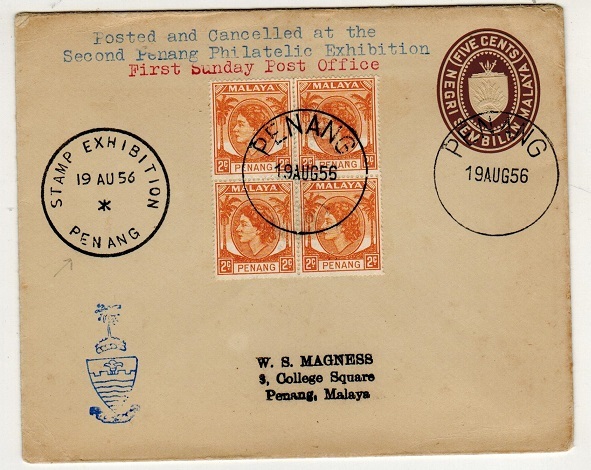 MALAYA (Selangor) - 1961 use of 'ON POSTAL SERVICE' postcard to Klang. 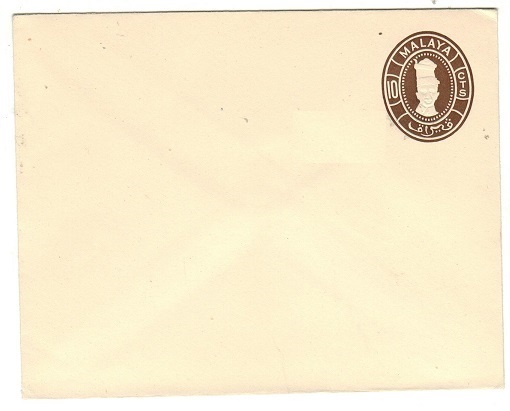 1961 use of pre-printed POSTAL SERVICE DEPARTMENT MALAYA/ON POSTAL SERVICE stampless card addressed to Klang sent from the Contrller Of Posts. 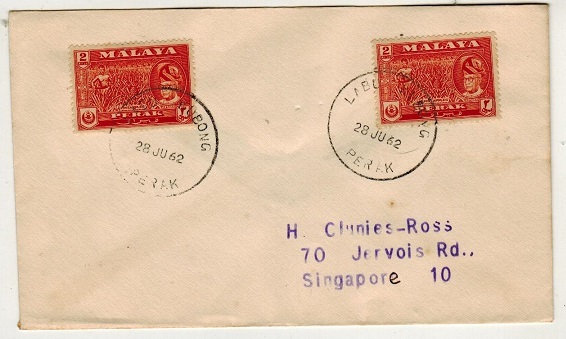 MALAYA (Selangor) - 1954 'ON GOVERNMENT SERVICE' envelope cancelled by red MALAYA 20c meter mark. 1954 (27.IX.) ON GOVERNMENT SERVICE stampless cover registered locally and struck by red KUALA LUMPUR/ MALAYA 20 CENTS meter mark. 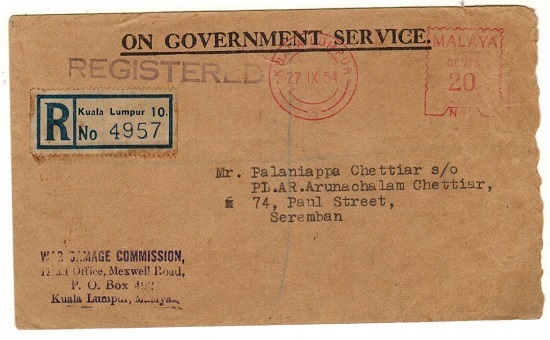 MALAYA (Negri Sembilan) - 1951 'ON GOVERNMENT SERVICE' cover used at PAUL STREET. 1951 (APR.14.) use of (RT/PR 7) ON GOVERNMENT SERVICE stampless cover addressed locally and cancelled PAUL STREET/SEREMBAN. 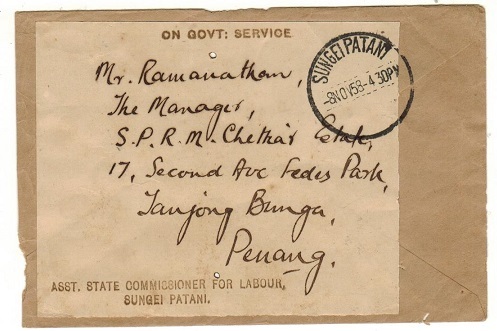 MALAYA (Kedah) - 1958 'ON GOVT SERVICE' cover used at SUNGEI PATANI. 1958 (NO.8.) 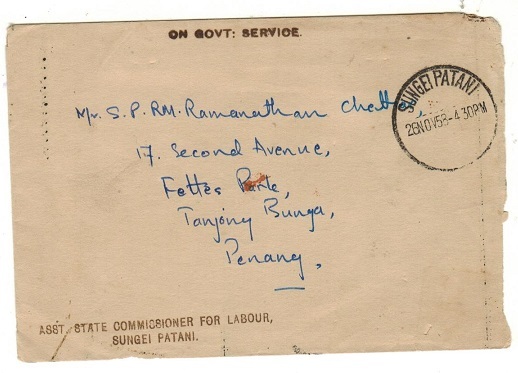 stampless cover addressed to Penang on a 'ON GOVT SERVICE' label and tied SUNGEI PATANI. 1958 (NOV.26.) cover addressed to Penang struck 'ON GOVT SERVICE' and cancelled SUNGEI PATANI. MALAYA (Straits Settlements) - 1936 15c blue RPSE uprated to Penang and used at BUTTERWORTH. H&G 8. 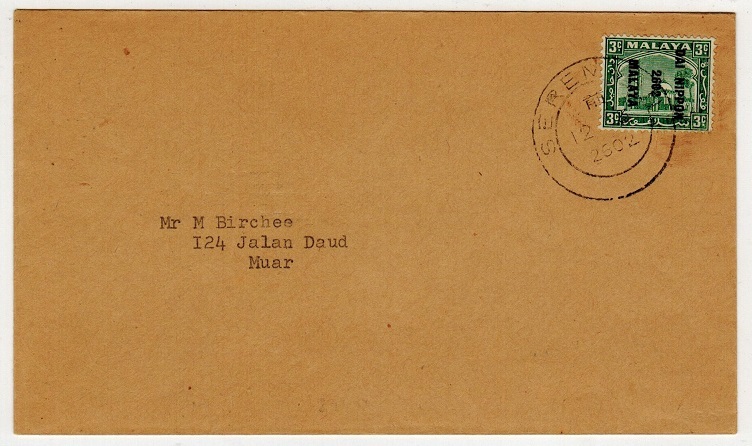 1936 15c blue on buff 'KGVI' registered postal stationery envelope (size G) addressed to Penang (overall toned) bearing additional 5c brown adhesive and tied BUTTERWORTH/S.S. cds dated 15.SE.1938. H&G 8. MALAYA (Perak) - 1962 4c rate local cover used at SUNGEI KOROK. 1962 (JU.28.) cover addressed to Singapore bearing 2c orange (x2) adhesives tied by the 'skeleton' SUNGEI KOROK/PERAK cds. MALAYA (Perak) - 1962 4c rate local cover used at RANTAU PANJANG. 1962 (JU.28.) cover addressed to Singapore bearing 2c orange (x2) adhesives tied by the 'skeleton' RANTAU PANJANG/PERAK cds. MALAYA (Perak) - 1962 4c rate local cover used at LABU KUBONG. 1962 (JU.28.) cover addressed to Singapore bearing 2c orange (x2) adhesives tied by the 'skeleton' LABU KUBONG/PERAK cds. MALAYA (Perak) - 1962 local registered cover used at KAMPONG DEW. 1962 (JY.13.) 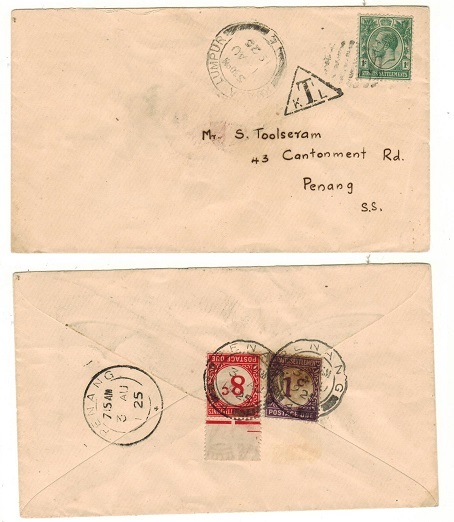 registered cover addressed to Singapore bearing 12c violet (x2) on front and 2c (x3) on reverse tied by the 'skeleton' KAMPONG DEW/PERAK cds. MALAYA (Perak) - 1962 2c rate local cover used at CHANGKAT JERING. 1962 (JU.28.) 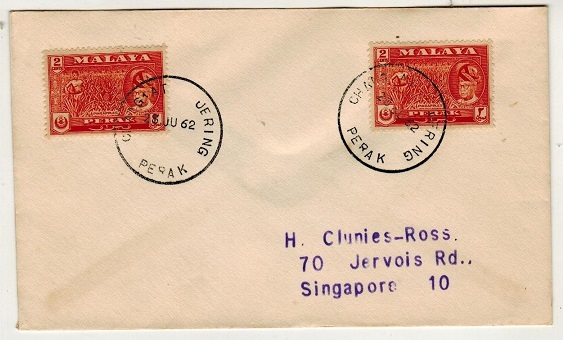 cover addressed to Singapore bearing 2c orange (x2) adhesives tied by the 'skeleton' CHANGKAT JERING/PERAK cds. MALAYA (Pahang) - 1963 4c rate local cover used at KAMPONG TEMAI. 1963 (JA.17.) 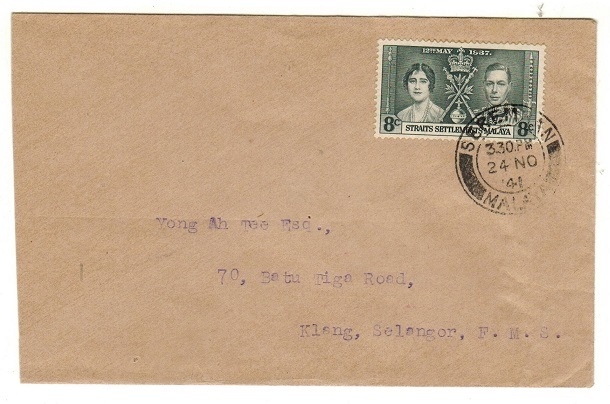 cover addressed to Singapore bearing 2c orange (x2) adhesives tied by the 'skeleton' KAMPONG TEMAI/PAHANG cds. 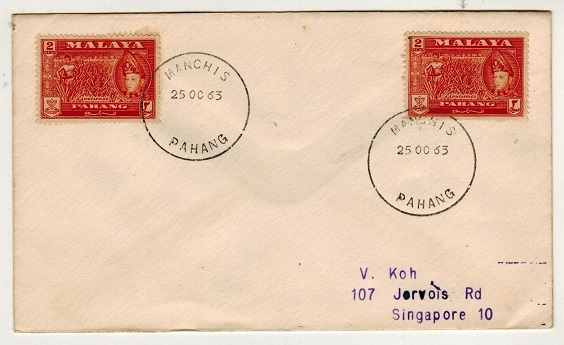 MALAYA (Pahang) - 1963 4c rate local cover used at MANCHIS. 1963 (OC.25.) cover addressed to Singapore bearing 2c orange (x2) adhesives tied by the 'skeleton' MANCHIS/PAHANG cds. MALAYA (Negri Sembilan) - 1922 6c rate cover to India used at KUALA PILAH. 1922 (JA.18.) 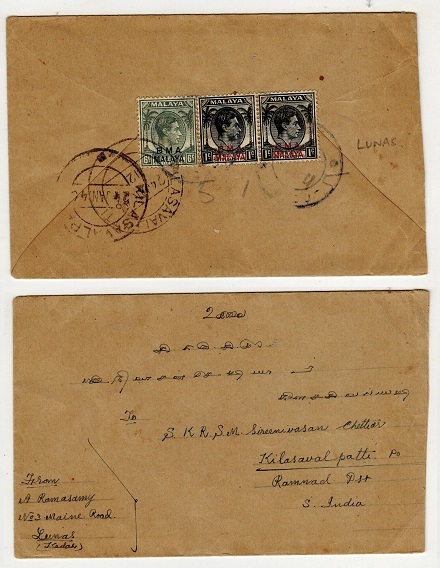 cover addressed to India (tear at left repaired) bearing FMS 3c grey adhesive pair on reverse side cancelled by KUALA PILAH cds. Proud type D5. MALAYA (Malacca) - 1937 15c Blue RPSE of Straits Settlements to Singapore uprated at MALACCA. 1937 (OC.15.) 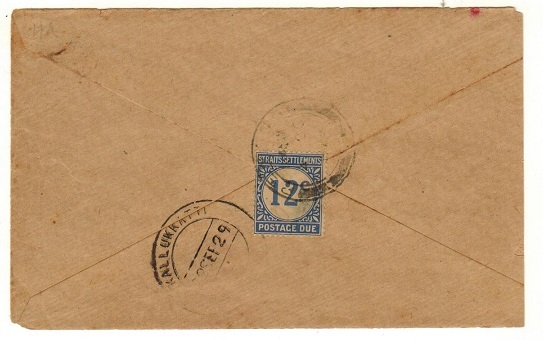 use of Straits Settlements 15c blue on cream (overall toned) registered postal stationery envelope (size G) addressed to Singapore with Straits 5c brown adhesive added and cancelled by d/r MALACCA cds. SINGAPORE arrival b/s. MALAYA (Penang) - 1943 12c rate local Japanese Occupation censor cover. 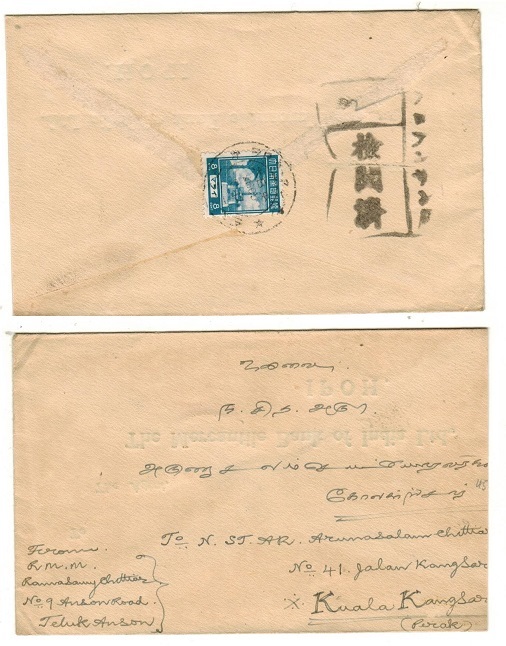 1943 cover addressed locally to Penang bearing 4c and 8c Japanese adhesives (SG J300+301) tied by individual violet three ringed Japanese cancels dated 4.29.2603 (Showa Calander) with violet boxed censor h/s between. 1943 cover addressed to Kuala Lumpur bearing Japanese 2c pale emerald Japanese adhesive (SG J298) tied by d/r MALACCA cds dated 2.9.2603 (Showa Calander) with violet rubber censor h/s at right. MALAYA (Perak) - 1945 8c blue Japanese Occupation local censor cover. 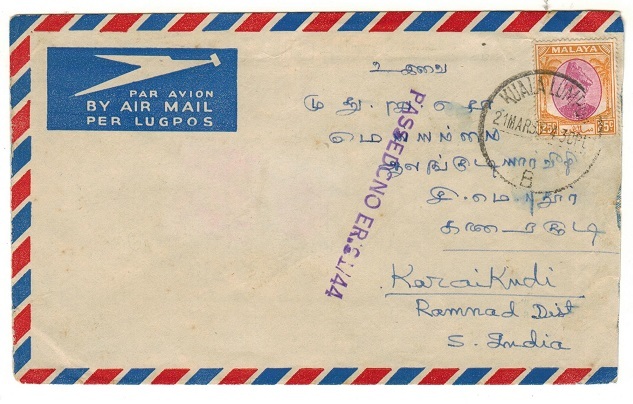 1945 cover addressed to Kuala Lumpur bearing Japanese 8c dull blue (SG J301) tied by Japanese cds dated 3.12.2605 (Showa Calander) with black rubber censor h/s at right. MALAYA (Perak) - 1946 50c rate 'BMA' cover to India with PASSED FOR/TRANSMISSION/T/158 censor. 1946 (NO.15.) 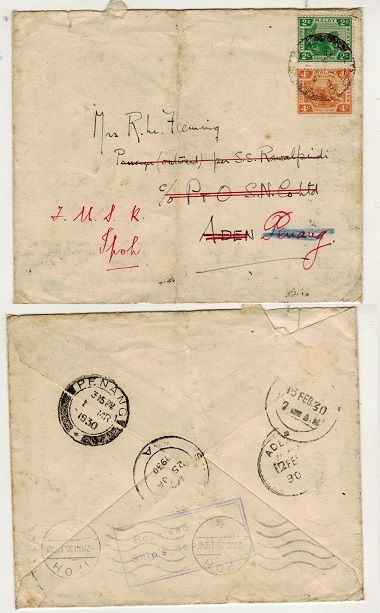 cover addressed to India bearing 25c 'BMA' overprint pair on reverse flap cancelled by IPOH cds with scarce violet PASSED FOR/TRANSMISSION/ T/158 handstamp applied and with scarce CENSORED/D/NEGAPATNAM strike applied on arrival. MALAYA (Negri Sembilan) - 1941 8c rate 'Coronation' cover to Klang used at SEREMBAN. 1941 (NO.24.) 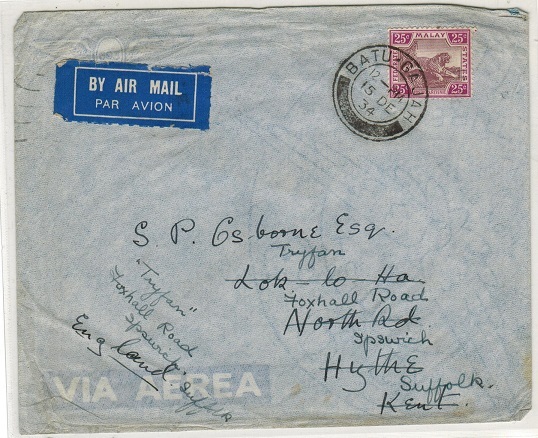 cover addressed locally to Klang (slightly reduced at left from opening) bearing Straits Settlements 8c grey 'Coronation' adhesive tied SEREMBAN/MALAYA. MALAYA (Perak) - 1949 10c chocolate brown on cream PSE unused. H&G 1. 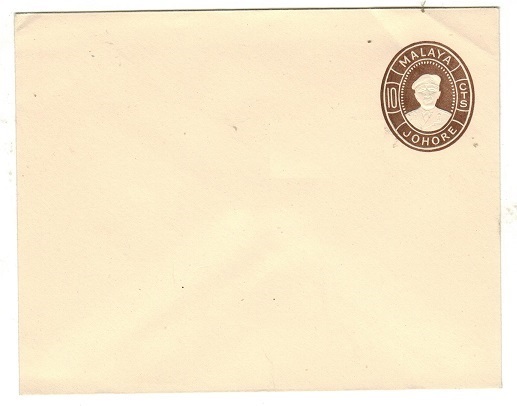 1949 10c chocolate brown on cream postal stationery envelope (rounded flap) in fine unused condition. H&G 1. MALAYA (Johore ) - 1949 10c chocolate brown on cream PSE unused. H&G 3. 1949 10c chocolate brown on cream postal stationery envelope (rounded flap) in fine unused condition. H&G 3. MALAYA (Penang) - 1949 10c chocolate brown on cream PSE unused. H&G 1. MALAYA (Kedah) - 1949 10c chocolate brown on cream PSE unused. H&G 2. 1949 10c chocolate brown on cream postal stationery envelope (size b) in fine unused condition. H&G 2. MALAYA (Selangor) - 1949 10c chocolate brown on cream PSE unused. H&G 2. 1949 10c chocolate brown on cream postal stationery envelope (rounded flap) in fine unused condition. H&G 2. 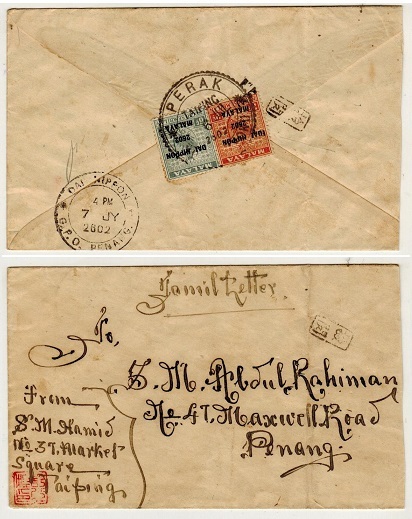 MALAYA (Perak) - 1891 (circa) local cover bearing 1c on 6c lilac surcharge adhesive. 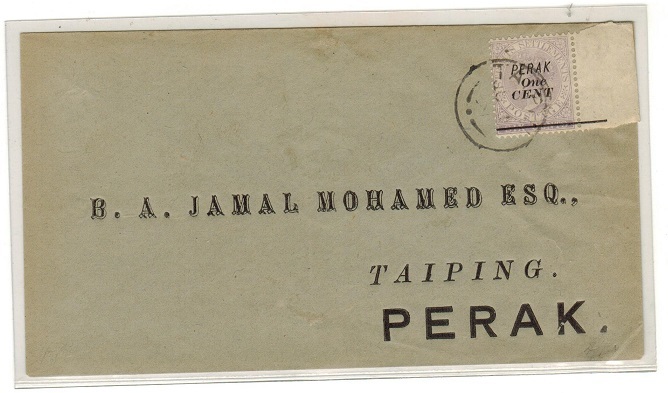 1891 (circa) 'Jamal Mohamed' locally addressed cover bearing 'One Cent' on 6c lilac adhesive of Straits Settlements overprinted PERAK (SG 43) and tied by light TAIPING cds. 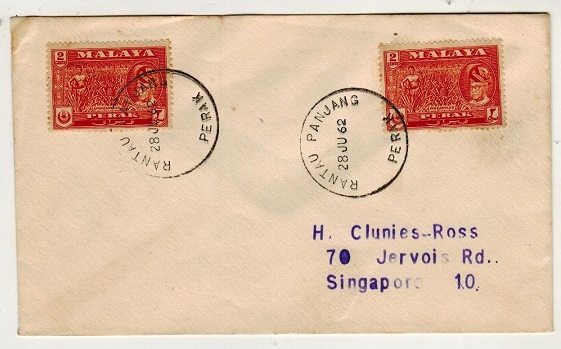 MALAYA (Selangor) - 1945 'POSTAGE FREE PERIOD' local cover used at KLANG. 1945 (SE.29.) small stampless cover addressed locally cancelled by d/r KLANG cds. 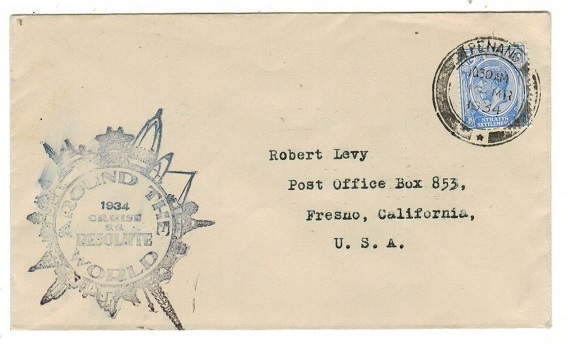 Sent 'FREE' post World War II during the concession. MALAYA (F.M.S.) - 1909 10c blue RPSE uprated to Penang at TAPAN. H&G 3a. 1909 10c blue on cream registered postal stationery envelope (size G) with stamp on the front addressed to Penang and bearing additional 3c 'tiger' adhesive tied by TAPAH/POST OFFICE cds dated 5.OC.1914. IPOH transit and PENANG arrival cds's. H&G 3a. MALAYA (F.M.S.) - 1920 12c blue RPSE uprated to Perak at TANJONG MALIM. H&G 4. 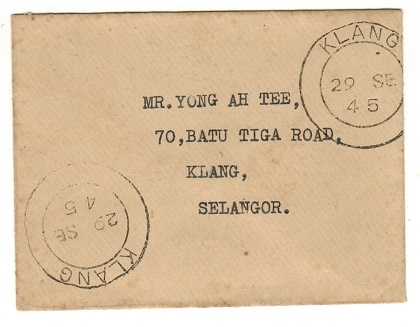 1920 12c blue on cream registered postal stationery envelope (size G) addressed to UK bearing additional 3c and 6c 'tiger' adhesives tied by d/r TANJONG MALIM cds dated 9.AU.1929. H&G 4. MALAYA (F.M.S.) - 1927 2c green PSC uprated to USA at IPOH. H&G 16. 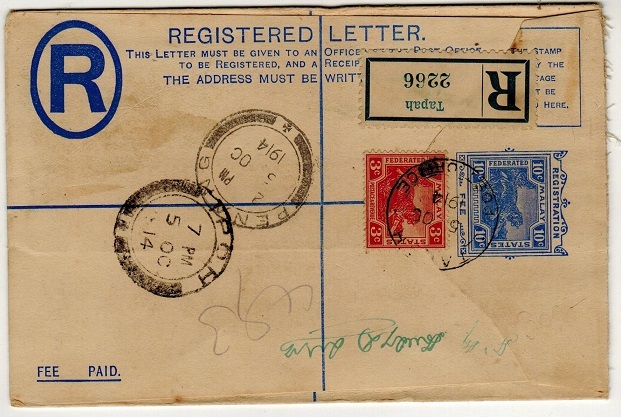 MALAYA (Kedah) - 1945 8c rate (BMA) cover to India used at LUNAS/SYBURI. 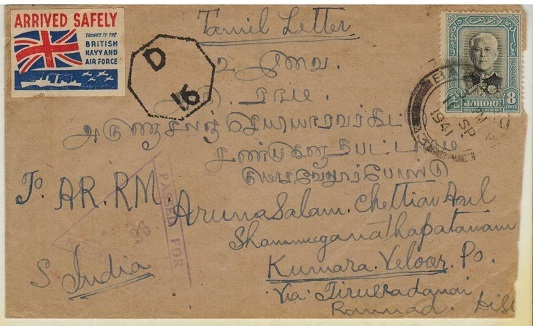 1945 cover addressed to India bearing Straits Settlements 1c black (x2) and 6c grey adhesives overprinted 'BMA' and cancelled by weak LUNAS/SYBURI rubber h/s in violet (Proud type D5) with manuscript '5.1.45' dating and with KILASAVALPATTI arrival cds dated 24.JAN.46. Complete with the original letter and with origin marked on cover front. A rare strike. MALAYA (Negri Sembilan) - 1946 (circa) 10c (BMA) rate cover used at BAHAU. 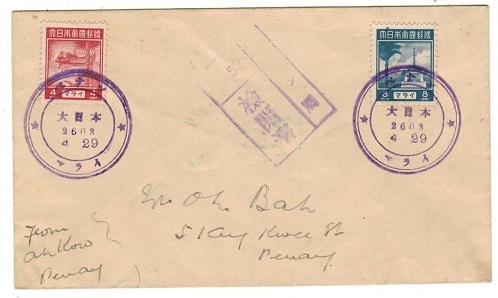 1946 (circa) local cover addressed in Chinese script bearing 'BMA' 2c and 8c Straits Settlement overprints on reverse flap tied by d/r BAHAU cds dated 26.4. but without year slug. Proud type D3- state 2. A further strike on the front. Scarce. MALAYA (Negri Sembilan) - 1943 3c green 'Jap Occ' adhesive on local cover used at SEREMBILAN. 1942 3c green 'Selangor' (Mosque) adhesive overprinted DAI NIPPON/2602/MALAYA sideways in black (SG J210) on cover to Muar tied by d/r SEREMBILAN cds dated 12.6.2602 for Japanese use. MALAYA (Penang) - 1950 'Negri Sembilan' 15c brown PSE used at STAMP EXHIBITION/PENANG. 1950 (circa) 10c dark brown on cream postal stationery envelope (H&G 2a - with pointed flap) addressed to Penang bearing an additional QEII 2c orange 'Penang' block of four and cancelled by s/r PENANG cds dated 19.AUG.56. Struck at left by scarcer STAMP EXHIBITION/PENANG cds of the same date. Marked 'First Sunday Post Office' and marked on reverse 'not more than 5 exist'. MALAYA (Penang) - 1905 'PAQUEBOT' postcard use to UK from PENANG. 1905 (SE.14.) 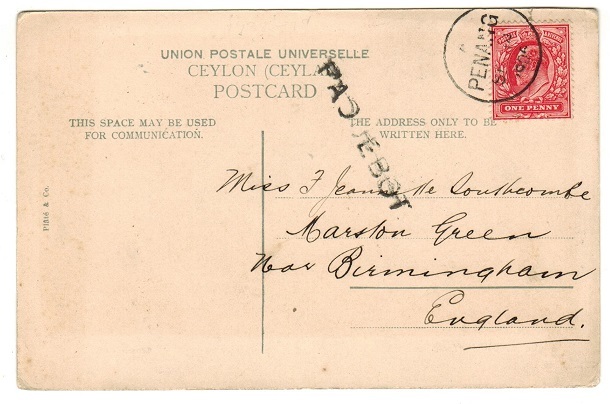 use of a picture postcard of 'Kandy-Ceylon' addressed to UK but bearing GB 1d red adhesive tied by s/r PENANG cds with black straight lined PAQUEBOT h/s at left. Proud type SL6. A scarce usage. MALAYA (Perak) - 1934 25c rate cover to UK used at BATU GAJAH. 1934 (DE.15.) 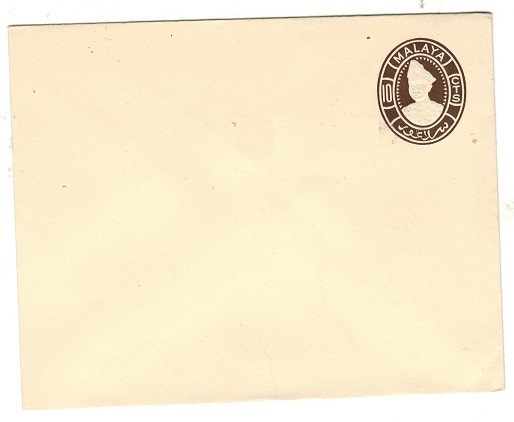 cover addressed to UK bearing F.M.S. 25c 'tiger' adhesive tied by BATU GAJAH cds.